There are nine surnames intimately associated with Scattery Island. First and foremost were the Keanes, Kanes, or O'Cahanes, traditional coarbs almost from the time of Senan. The other family names of Scattery were Scanlon, MacMahon, Brennan, Melican, Hanrahan, Hehir, Moran and Griffin. During the 18th and 19th centuries, many of the inhabitants of the island earned their living primarily as river pilots. The women of the island were also great oarswomen and considered the finest currach-handlers in Ireland. The pilots raced each other to reach the approaching ship first. Whoever did so, put their mark on the vessel and this entitled them to navigate the ship up-river to safe anchorage in Foynes, Clarecastle, Limerick or elsewhere. This was a hazardous occupation and by the mid 19th century, 12 men had been drowned while working as pilots. Some families bought land and houses with prize money earned from shipwreck salvage. In March 1843, pilots from neighbouring Kilbaha boarded a deserted ship, The Windsor Castle of Liverpool, which had left Bombay in June 1842. The pilots succeeded in bringing the vessel to Kilbaha and, next day, to Scattery Roads, all the time protecting her from plunder. The pilots were offered compensation for their efforts, which they refused. After a long legal battle they were compensated to their satisfaction. In the 1840s Scattery was part of the estate of the Marquis of Conyngham whose son-in-law, Marcus Keane, acted as land agent. 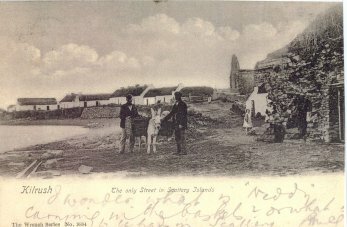 Keane approached the compensated families and offered to sell them land on Scattery, an offer which many families took up, increasing the population of the island considerably. The census shows an increase in population between 1841 and 1881 when it recorded 141 inhabitants. From 1926, it declined rapidly due to economic and social factors. After World War II some families moved to the mainland, principally to educate their children. 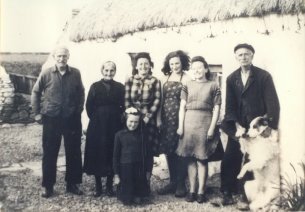 They were followed in 1960 by most of the remaining families, many of whom built houses in Cappagh, Kilrush. The last people to leave the island were Bobbi and Patty MacMahon, a brother and sister, in 1978.